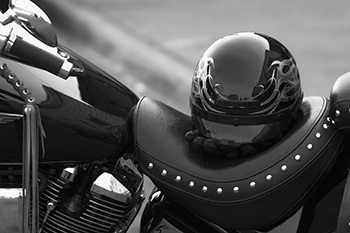 Motorcycle seats and apparel play a big part in the pleasure you get from riding and are crucial to your safety and comfort. Exposed to the sun and less desirable weather conditions they can wear prematurely if they don’t get the Tender Loving Care they deserve. Other articles will give you general guidelines. For example, the article “Oiled leather” (for oiled tanned leather riding boots or chaps), “How to care for leather jackets?” and “How to clean and condition leather saddles?”. 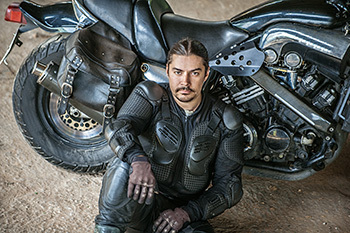 This supplementary information article only tackle leather maintenance tips specific to motorcycle riding. Maintenance can be divided in 3 steps: Cleaning, Moisturizing or conditioning, and Protecting. URAD leather cream is considered and all-in-one product as it clean, moisturize, shine and protect leather in one application. That is true in normal conditions. Being exposed to the sun is harsh on leather, but at the same time, being hit by 100 km/h winds (filled with dust, humidity and bugs!) cannot be considered normal conditions. This is where this article jumps in. High-speed winds push dust and dirt into leather. These must be removed regularly otherwise they fill up leather pores and dry out leather. For this purpose, a good cleaner must clean well, not leave any residue and must contain no chemicals or minerals that can damage the leather. AQUILA leather cleaner fits the bill. It cleans remarkably well and it can be used over and over without problems. It cleans gloves, chaps, seats, jackets, bags, rubber handles, etc. Use Aquila as often and as quickly after riding as possible. For bugs on leather, areas of accumulated dirt or grease, or rubber handles, spray AQUILA and let it work its way into the dirt, then wipe. Repeat if needed. Moisturize and condition your leather seats with URAD. URAD’s lanolin moisturizes leather and its carnauba wax provides protection again sun’s UV rays and rain. Alternatively, you can use a mixture of URAD and TENDERLY (about ½ and ½) as TENDERLY will keep the leather soft and supple and makes URAD easier to apply. For leather saddles and side bags see article: “How to clean and condition your leather saddle?” In short, apply like you would apply skin cream, rubbing it in until it penetrates leather completely. Use caution to prevent build up in stitching areas. Do not apply in direct sunlight. If color is slightly faded use URAD with Color (instead of URAD neutral), but if color is badly damaged, use the “Color restoration technique”. For clothing, read the article on “How to care for leather jackets”. And as a specific note, Motorcycle jackets are often coated in such a way that moisturizing creams do not penetrate easily. This might protect it from rain but it can make the jacket more difficult to moisturize. Using the same mix that we use for very porous leather will usually be what works best (Mixing ¾ TENDERLY for ¼ URAD). Also, before applying URAD or the URAD – TENDERLY mix, always clean the jacket to remove dust and dirt that could block the moisturizer from getting in. URAD will provide enough protection (in the moisturizing step) and it will just be a matter of how frequently you will need to do the treatment. But if you find yourself in the rain often, or live near ocean’s salty air or in other situations that require you to do it too often, you might want to consider a more drastic waterproofing solution. SAHARA is an industrial strength, long-lasting spray on waterproofing agent and offer the best possible protection. If SAHARA is for you, clean the jacket with AQUILA first. Apply SAHARA in thin layers, leaving it to dry between each coat. 2 to 3 thin layers provide protection for 1 to 3 years! Leather needs to be kept healthy to provide you with the best protection and comfort possible. These steps require minimum time and effort and will make a huge difference in the long run. Taking the time to clean, moisturize and protect all your leather will preserve their qualities, will keep them looking good and will confirm leather’s natural longevity!